O righteous and merciful Juliana, who wast chosen by God, and amidst worldly cares didst in thy soul live in Christ, as in heaven; and who didst abide in great stillness, loving silence within thy heart! Glorifying the Lord Who hath glorified thee, with compunction we sing to thee a hymn of praise. Do thou, who endured grievous sorrows in thy life, pray for us, who are tempest-tossed by perils and sins, and entreat the merciful Savior to grant us salvation of soul and deliverance from misfortunes, that, giving thanks unto God, we may glorify thee, saying: Rejoice, O merciful Juliana, boast of Murom and adornment of women! A pure angel, from earliest childhood thou didst love the angelic monastic life; but the Creator of all, Who arrangeth all things in the depths of His wisdom, ordained a different path of salvation for thee-that thou please Him with a holy life within honorable matrimony. Wherefore, from childhood He led thee to the kingdom of God through many trials: for when thou wast a maiden six years of age, thou hadst already become a grieving orphan; and as a young bride thou didst soon take up the cross of motherhood. And we, though stricken with awe at this wondrous providence, yet compunctionately praise thee with faith: Rejoice, thou who wast born into wealth, to parents who loved the poor-Justin and Stephanida; rejoice, thou who, deprived of thy mother, wast raised an orphan outside thy father's house! Rejoice, right fragrant lily who blossomed within the tranquility of the forests of Murom; rejoice, radiant star set alight by God in the village of Lazarevo! Rejoice, thou who in thy heart acquired love for Christ and His all-pure Mother; rejoice, pure ewe-lamb who from childhood sought the monastic order! Rejoice, meek and obedient one, who by the will of God wast entrusted to a husband; rejoice, righteous mother who, having lived in the world, hast been numbered among the saints! Rejoice, O merciful Juliana, boast of Murom and adornment of women! Seeing thee standing in vigil all night, the enemy of the Christian race assailed thee with vile terrors. But thou, O blessed heifer, didst cry out with tearful entreaty to thy guide, the all-wondrous Nicholas; and the wonder-worker straightway appeared to thee, and the demons vanished like smoke. Then the holy hierarch blessed thee, saying: �O my daughter, be thou of steadfast good cheer, for Christ the Lord hath commanded me to preserve thee from all evil. And do thou chant to Him without fear, ever crying aloud like the angels: Alleluia! The human mind is at a loss how, while living in this vain world, O blessed mother, thou didst in soul abide untroubled in the mansions of heaven; how, living amid abundant wealth, thou didst regard it dispassionately as something belonging to others and entrusted to orphans; how, bearing thy cross in honorable matrimony, though thou wast like a nun amid the world, thou didst raise many holy children. And we, knowing what is impossible for men, and praising God Who can accomplish all things, with undoubting faith honor thee thus: Rejoice, quiet dove who unceasingly conversed with God in prayer; rejoice, obedient disciple who knewest how to live in both abundance and in want! Rejoice, faithful spouse who saved thy husband by being a model of meekness; rejoice, much suffering mother who entrusted thy pure children to the Lord! Rejoice, chaste woman who pleased God by childbearing and holiness; rejoice, merciful lady who, following the Gospel, didst meekly minister to thine own servants! Rejoice, handmaid of Christ, who kept His commandments throughout thy life; rejoice, thou who wast obedient to Paul, doing all things for the glory of God! Rejoice, O merciful Juliana, boast of Murom and adornment of women! Possessed of a heart which hath pity for all, and which is overflowing with grace-filled love, O Juliana, thou didst truly show thyself to be a merciful mother when God visited thy land with a terrible famine; for, though thou didst thyself experience want, thou wast sustenance for those who hungered and thirsted, a guide for the blind and the halt, protection and vesture for the unsheltered, and comfort for all. And thy least, hungering brethren, rending praise unto God, earnestly blessed thee thus: Rejoice, thou who illumined the dark time of famine with the light of love; rejoice, thou who rendered mercy unto Christ in the guise of thy least brethren! Rejoice, thou who like the warm sun shinest forth earthly good things; rejoice, thou whose left hand knew not what thy right hand was doing! Rejoice, thou who, feeding the starving with bread, didst deliver them from death and torment; rejoice, thou who, warming the desperate with a word of welcome, didst greatly console them! Rejoice, thou who, seeking the kingdom of God, didst distribute things good for the body; rejoice, thou who having acquired friends through riches, didst find the dwellings of heaven! Rejoice, O merciful Juliana, boast of Murom and adornment of women! Amid the tempest of misfortune which beset the whole land, when for their sins the people were punished with a deadly plague, with great diligence, O loving soul, thou didst fulfil the word of Christ concerning the sick, secretly helping them without the knowledge of thy household; and offering up fervent prayers for them, thou didst receive from God the gift of healings, and requesting services for the departed in church, thou didst accompany them to their everlasting rest. And now thou hast received from God the blessed kingdom, where sickness and grief are unknown; and joining chorus there, thou chantest unto God: Alleluia! Hearing on one of those bitter days that thine eldest son had been cruelly slain by a servant, thou wast wounded in thy maternal heart, O cross-bearing woman. Yet thou wast not so much saddened by his death as thou wast grieved by the suddenness of the end of his life; and thou wast all the more distraught over the criminal murderer. But remembering the Lord Himself, Who shed drops of blood in Gethsemane, thou didst strengthen thyself in prayers to Him, immersing thy maternal sorrow in His will. And we, marvelling at thy humble faith, chant these praises as is meet: Rejoice, thou who didst look upon this earthly life as a sorrowful sojourn; rejoice, thou who didst regard the repose of thy family as a brief separation! Rejoice, thou who allayed worldly griefs with trust in the will of God; rejoice, thou who, unlike the wife of Job, strengthened thy despondent husband in the faith! Rejoice, thou who forgave the senseless murderer as Christ forgave those who crucified Him; rejoice, thou who asked the Redeemer of the world that He give the kingdom of heaven to thy son! Rejoice, thou who by sorrows didst detach thy heart from the earthly world; rejoice, thou who by suffering thy cross didst warm thy love even more greatly for God! Rejoice, O merciful Juliana, boast of Murom and adornment of women! By the will of God thy second beloved son also met an untimely death on the field of battle; yet accepting this cross also without complaint, thou didst splendidly honor thy younger offspring with many prayers, forty memorial liturgies, and generous alms. And having consoled thy husband with good words, that he not again lose hope in God, with tears of compunctions, like a wounded dove, thou didst thyself spend many nights quietly in prayer, considering a departure from the world, and transforming funeral lamentations into the hymn of praise to the Almighty: Alleluia! Seeing thee yearning to hide thyself from the world in a convent, thy spouse besought thee not to leave him bereft with five children. And thou, O meek ewe-lamb, having learned humbly to cut off thine own will for the sake of others, obediently said: �Let the will of the Lord be done!� And again taking upon thy shoulder, which had been wounded by cruel sorrows, the cross given thee by God, of struggle in this world's life, thou didst increase all the more thy vigils, fasting and prayers, living in matrimony like an unmarried desert-dweller. And we, marvelling at thine obedience and ascetic feats, humbly offer thee these praises: Rejoice, thou who didst enter into the mystery of matrimony, which thou didst solemnly preserve; rejoice, spouse faithful to thy husband, whom thou didst serve with humility! Rejoice, ascetic mighty in this world, who didst bear thy cross with patience; rejoice, victor over the carnal passions, who vanquished the enemy in battle! Rejoice, thou who kept thy vesture of thy soul white in this benighted world; rejoice, star of quiet brilliance, shining amid the tumult of life! Rejoice, thou who didst pray fervently in the married state, a model of ardor for monks; rejoice, sufferer, meek mother, who emulated the saints in the torments thou didst endure! Rejoice, O merciful Juliana, boast of Murom and adornment of women! Thy son Callistratus showed himself to be the proclaimer of thy life of suffering, for he recounted to the world thy secret and wondrous struggle: thy prayers continued throughout the night; thou didst set sharp-edged planks as a bed for thy body; thy hands became calloused through thy many prostrations; thy flesh became desiccated by intense fasting; thine eyes were bathed with rivers of tears; and thy pure tongue continually chanted the hymn: Alleluia! Grace shone forth in thy heart, O holy mother, and gave thy prayer wings to soar far above all things. Ablaze with divine fire, and drawn to God like a bird of paradise, thou didst desire to visit the temple of God; for thy spirit was borne thither, casting off all the grief of life; and thou wast sweetly consoled amid thy sorrows, receiving the gift of grace from the Father. And we, the slothful, beholding the zeal for God which was in thy soul, are able only to glorify thee with our tongue, crying out thus: Rejoice, thou who, receiving the fire of grace, didst soar aloft from earth to heaven; rejoice, thou who, having tasted the sweetness of paradise, didst make thine abode in Christ Jesus! Rejoice, thou who, burning with love for God, didst receive from Him the gift of tears; rejoice, thou who, though praying in secret, didst love church more than thy home. Rejoice, thou who, contemplating the redemption wrought by the Lord, didst spend Fridays alone and without food; rejoice, thou who, emulating the incorporeal angels, didst refuse to sleep, that thou mightest pray! Rejoice, thou who, having acquired grace in thy heart, created a temple of God within thyself; rejoice, thou who, receiving the Holy Mysteries, didst provide an abode for the Holy Trinity in thy soul! Rejoice, O merciful Juliana, boast of Murom and adornment of women! Desiring, after the repose of thy friend, to cleave unto heaven with all thy soul, thou didst add struggles unto struggles, O righteous one; and emulating Christ above all, thou didst struggle ascetically in humility and love. Wherefore, thou didst receive from Him the gift of tears of compunction and a heart full of mercy for all; and living while yet on earth as though in heaven, thou didst offer praise unto God, chanting: Alleluia! A new sign did the Lord reveal in thee: for, distributing warm garments unto all, it then being a cruel winter, thou didst cease to go to the church of God. 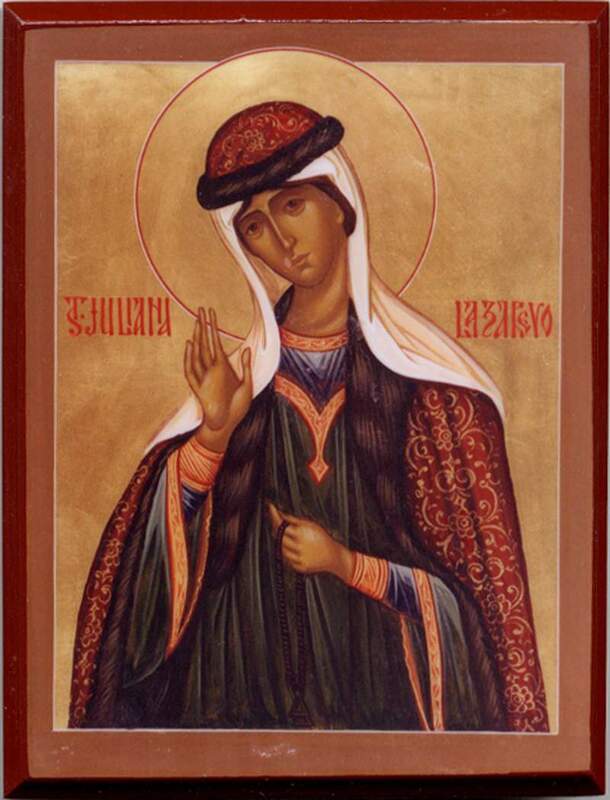 Yet one morning, when the priest of God went to the Church of the Righteous Lazarus, he heard a voice issue forth from the icon of the all-pure Mother of God, saying: �Go and say to the merciful widow Juliana: Wherefore dost thou not come to the church of God to pray? Prayer at home is pleasing unto God, but not as is prayer in church!� And then the voice spake further, saying: �And do thou honor her, for she is not less than sixty years of age, and the Holy Spirit resteth in her!� And when thou didst with fear learn of this wondrous miracle, thou didst beseech all who heard of it to keep silence, and didst make all haste to the all-pure Mistress at the church of God, and kissing her icon with fervent tears, didst humbly offer up hymns of supplication. And the faithful people, rejoicing radiantly that the Queen of heaven, the joy of all joys, loved thee so, thus glorified thee with gladness: Rejoice, thou who loved Christ with all thy heart; rejoice, thou who offered him fervent tears! Rejoice, thou who considered love to be greater than prayer and fasting; rejoice, thou who ever attended all the services of the Church! Rejoice, thou who wast called merciful by the Mother of God; rejoice, thou who within thyself wast wholly overshadowed by the Holy Spirit! Rejoice, thou who received glory, not from men, but from the holy Theotokos; rejoice, tranquil radiance illumining the region of Murom! Rejoice, O merciful Juliana, boast of Murom and adornment of women! Strange and wondrous is it to see how on earth God giveth the greatest sorrows to His beloved children, as a surety of His love for them. Wherefore, unto thee, O blessed one, who received great mercy from the Mother of God in His church, it was also fitting to receive a greater measure of griefs, that thou mightest show forth grateful love for God and thyself be glorified, and that thou mightest teach sorrowing people to have patience, that all may sing the praise: Alleluia! When by God's incomprehensible providence a great famine again befell thy land, all experienced want, and even thou, the merciful widow, didst fall into dire poverty. Yet entrusting thyself and thy children to the oversight of God, thou didst command them to endure all things unto death; and thus also didst thou earnestly beseech thy servants, that they dare not to touch anything belonging to anyone else. And obedient, though they were afraid, they kept this commandment and said to thee: Rejoice, thou only consolation in that grievous time of great famine; rejoice, thou who suffered in the flesh, seeking all the more the heavenly city! Rejoice, thou who amid dread manifestations didst consider the precepts and wrath of God; rejoice, thou who as a mother didst have compassion for children who were tormented with hunger! Rejoice, thou who by the power of faith didst endure sorrows without measure; rejoice, thou who didst instruct thy children and thy servants, who were of one mind with thee, to be obedient to the Cross! Rejoice, thou who prayed to God, shedding tears with those who wept, and suffering with the people; rejoice, thou who with ardent heart didst grieve in soul for sinful Russia! Rejoice, O merciful Juliana, boast of Murom and adornment of women! Every living creature, receiving food for itself in due season, praiseth Thee, the good God, who openest Thine all-generous hand unto all, even before Thou art asked. But Thy mighty favorite, seeking the kingdom of heaven even when deprived of the good things of Thine earth, never ceased to cry out to Thee in praise: Alleluia! Earthly rhetors are at a loss to describe with their tongues the pangs of mothers' souls when they are crushed by the sufferings of their beloved children; and thou, o steadfast sufferer, while pouring forth thy mercy upon all, yet unable to find bread for thine own children, didst feed them pig-weed, comforting them by saying repeatedly: �Glory to God for all things!�. And we, learning the power of patience from thee, honor thee fervently with voices of praise: Rejoice, sojourner strange to the earthly world, who didst bitterly wander throughout the world; rejoice, thou who, seeking the heavenly city, didst remain in this world a homeless orphan! Rejoice, thou who, having been possessed of great wealth, wast shown to be a pauper, hungry and poorly clad; rejoice, thou who before gavest alms, but later wast among the children bereft of bread! Rejoice, thou who, looking to the joy which is to come, didst take up thy present cross with hope; rejoice, thou who, having surrendered thyself to the will of the Lord, didst accept the path of poverty and wandering! Rejoice, thou who looking to the sufferings of Christ, didst without murmuring endure thy cross in this life; rejoice, thou who, strengthened in weakness by the Spirit, didst in the midst of sorrows sing, �Glory to God for all things!� Rejoice, O merciful Juliana, boast of Murom and adornment of women! Desiring from childhood to save thy soul, thou didst think upon God in silence with all thy heart; and diligently caring for thy kinfolk like Martha, thou didst in spirit love the portion of Mary. And ever desiring the blessed life, thou didst keep the memory of death continually in the mind, praying the Jesus Prayer in thy heart, thereby sweetening thy bitter life, until thou didst reach the vault of heaven, the uttermost desire, O venerable one, crying unto God: Alleluia! Thou didst show forth the power of courage in thy weak body to be a rampart which the waves of life could not demolish; and submitting to the law of nature and subjected to many sorrows, thou didst reach the end of thy life at a goodly old age. And the good God, Who alone is holy, desiring to see thee as a pure pearl, sent thee sickness on the second day of His Nativity, that when beholding the Savior of the world, like Symeon thou mightest say to Him in parting: �Let thy handmaid depart this life in peace, O Master, that I may behold Thee, mine only Glory and the Savior of my sinful soul.� And thy kinfolk compassionately comforted thee well, saying: Rejoice, thou who traversed the sea, reaching the calm haven; rejoice, thou who didst leave this world, awaiting the heavenly bridal-chamber! Rejoice, thou who never condemned anyone and art thyself not condemned by the Judge; rejoice, thou who, having wrought deeds of mercy, dost enter the ranks of the all-wise virgins! Rejoice, thou who hast flown aloft to the mansions on high, on wings of dove-like meekness; rejoice, thou who before didst contemplate Christ, the gentle Light of life everlasting! Rejoice, thou who like an all-radiant beam didst flow into the bridal-chamber of the Father; rejoice, thou who hast thine abode with the choir of the saints in the Holy Spirit! Rejoice, O merciful Juliana, boast of Murom and adornment of women! Yearning to hear the chanting of the angels in the mansions on high, thou didst not cease to utter tearful prayers even on thy death bed; for, though suffering greatly in body and lying abed during the day, at night thou didst secretly rise up to pray, and like a guttering candle didst give off thy last flame. And when others learned of thy nocturnal struggle, O dove of God, thou didst meekly say to them: �God examineth the spiritual prayers even of one who is sick.� For even the angels praise Him unceasingly, crying ever: Alleluia! Though greatly sanctified by the holy light, the grace of the Spirit, thou didst ever consider thyself to be a wretched sinner. Wherefore, trusting only in the mercy of the Savior, thou didst tearfully receive the most Holy Mysteries after a fervent confession, O honored one. And thus, united in heart with thy Redeemer, and receiving the surety of the eternal kingdom without doubting, thou didst leave unto thy children and and to all a testament of love, prayer and almsgiving. And then, lying down, taking up thy prayer-rope, and making the sign of the Cross, thou didst utter thy last words: �Glory to God for all things! Into Thy hands do I commit my spirit. Amen.� And thus, like a lamp guttering out, thou didst quietly fly away from the earth to the dwellings of incorruption, in a dream commanding that thy body be buried next to thy husband and friend. And we, compunctionately rejoicing with thy close kinfolk at thine unashamed and peaceful repose, following thine ascent, sing glorious praise with the angels, chanting: Rejoice, thou who at thy final and grievous hour didst provide a model of humility; rejoice, thou who wast for us an image of prayer until thy reflection disappeared! Rejoice, bride of Christ, whose head the Bridegroom adorned with a crown; rejoice, pure and holy temple who before thine end wast covered by God with a white kerchief! Rejoice, thou whose holy body was more fragrant than the lilies of the field even after death; rejoice, thou who wast illumined at night by candles lighted by an invisible power! Rejoice, thou who easily passed through the arial way-stations because of thy mercy toward the poor; rejoice, thou who endured many crosses and hast reached the kingdom of God! Rejoice, O merciful Juliana, boast of Murom and adornment of women! Having received the grace to offer up prayers for the world from which thou hast departed, in thy love thou hast not forsaken those who love thee and are beloved of thee on earth; and having splendidly attained unto the mansions of heaven, thou hast been vouchsafed blessed joy with those who passed on before thee. And thy sons, guided by thy spirit, led a pious life, teaching one another to preserve Holy Orthodoxy. And thy one daughter, Theodosia, receiving the monastic rank in thy stead, reposed in holiness in the great schema, soaring aloft unto thee, like a chick under thy wings. And we today, composing heartfelt hymns to thee with love, do earnestly pray: Entreat Christ God in our behalf, that with thee we may all ever offer up to Him, unto the ages of ages, the hymn: Alleluia! O holy woman, the all-glorious Church of Christ singeth funeral hymns of gladness unto thee, having wondrous and beautifully found thy relics to be fragrant; and having reckoned among the choir of the saints thee who before wast blessed exceedingly by the Mother of God herself, it now rejoiceth all-radiantly: for it is meet to glorify those whom God hath glorified; for the honor rendered the saints redoundeth divinely unto God Who resteth in the saints. Wherefore, leaping up in heart and joining chorus in the Spirit, O ye Orthodox people, with the angels let us today all chant together: Rejoice, adornment of the land of Murom; rejoice, ornament of the nation of Russia! Rejoice, beauty of Christian women; rejoice, summit of holy mothers! Rejoice, thou who wast upborne to paradise by the angels; rejoice, thou who hast been blessed by the Lord! Rejoice, boast of thy kinsmen; rejoice, consolation of all who honor thee! Rejoice, O merciful Juliana, boast of Murom and adornment of women! O merciful and pure turtledove, blessed and righteous Juliana! With thy wonted love accept these fervent praises, and as a mother full of pity, who carest for thy children, beseech the all-merciful Savior, that He grant us a single boon-the divine grace of the Holy Spirit, wherein all the good things of earth and of heaven are hid; that having been enriched thereby, we may pass through this sorrowful life untroubled, and with thee may receive the blessed kingdom of the all-holy Trinity, gloriously crying out thereto: Alleluia! Alleluia! Alleluia! THIS KONTAKION IS CHANTED THRICE, WHEREUPON IKOS I AND KONTAKION I ARE REPEATED. O blessed and righteous Juliana, who wast wondrously called the merciful widow by the all-holy Theotokos! Unto thee, a mother full of pity, do we earnestly have recourse, praying that we also may be granted mercy. For, having endured many crosses in thy life, and been thyself tried by all things, in thy supplications thou art able to help us in our bitter trials; for, beset by many sins and weighed down by great sorrows, we are assailed by cruel enemies. Wherefore, O mother who bore thy crosses, ask for us the spirit of meekness and patience, sincere repentance of our sins, the power to oppose the invisible foe and to defeat them, and firm trust in the will of God amid all misfortunes and perils, that we may take up our cross without murmuring, unto the salvation of our souls, and may proceed with faith for Christ our Savior. Moreover, beseech the all-merciful Lord, O merciful favorite of God, that He cause to dwell in us, as it did in thee, the grace of a heart which hath mercy upon all, which blesseth even one's enemies, which accuseth itself only of sins, as thou didst: for love hath grown exceeding scarce because of our iniquities; and in name only can we show ourselves to be disciples of Christ, while in heart and deed were are as pagans, caring only for ourselves with love of self. O blessed one, intercede also for the Russian land, and for all who are in dispersion, that they may receive peace and prosperity, and all the more a return to thine ancient piety, a quenching of malice and envy, and increase in brotherly love and reconciliation, repentance for our passions, and cleansing and sanctification through grace. That with one mouth and one heart we may all again confess the consubstantial and indivisible Trinity unto the ages of ages. Amen. O merciful Juliana, helper of orphans, mother who bore thy cross! With thy generous right hand make bestowal upon us who now pray to thee, and ask the all-merciful God, Whose very name is love, that He grant us rich mercies. Be thou a good helper unto mothers who have given birth unto children; a holy preserver of purity and love within marriage; a wise nurturer of little children and youths; a compassionate comforter of the orphaned and sorrowful; a sympathetic healer of those who are tempest-tossed by sins; a mighty defender of those subjected to trials by their enemies; and a merciful mediator before God and the all-pure Theotokos for all who ask thine aid. And pray thou all the more, O holy favorite of God, that we be given the grace of the all-holy Spirit, that preserved thereby and saved unceasingly in this life, with thee we may glorify the all-merciful Redeemer, our Lord and Savior Jesus Christ, to Whom is due glory, with His all-good Father and His holy and all-compassionate Spirit, unto the ages of ages. Amen. TRANSLATED BY THE READER ISAAC E. LAMBERTSEN FROM THE CHURCH SLAVONIC. ALL RIGHTS RESERVED.